TL;DR: I created and released a complete Windows NT-family syscall table. See the bottom of the post for a link. For the last couple of years, the Metasploit project (gritz skape!) has been hosting a table of the core Windows kernel services, also known as system calls (originally available at http://dev.metasploit.com/users/opcode/syscalls.html). In its final version, the table included information regarding Windows NT (all recent service packs), 2000 (all service packs), XP (up to SP2), 2003 (up to SP1) and Vista (up to SP0). As years passed, new operating system editions were being released by Microsoft, while existing ones had new Service Packs made available for them. Consequently, due to lack of active maintainance, the project has became partially outdated, and eventually disappeared from the metasploit domain around four weeks ago. As the table width has grown up to quite a large size (it didn’t fit into my laptop’s monitor), I had to narrow it. In its current form, you can expand and hide information about individual Windows editions, or simply show all of the items (check the Show all and Hide all buttons). As a remainder, I have been also hosting the Windows Graphical System Call list for both 32- and 64-bit system versions (blog post). I will do my best to fill the rest of the empty cells in a few days. Comments? Suggestions? Feel free to drop a line. Oh by the way, in case you haven’t noticed yet: Michal Zalewski’s (aka lcamtuf) new book called “The Tangled Web” went public just two days ago. Suffice to say it’s a very solid book, focused on all the small details and quirks the modern client-side web security is all about. For more information, see http://nostarch.com/tangledweb.htm or http://lcamtuf.coredump.cx/tangled/. Update (22.11.2011): I have just uploaded the requested 64-bit version of the table, find it here. Your syscall ids for Winodws 7 are totally wrong. I just noticed it with NtQueryInformationProcess. In your table it is 0x00ea but the correct value is 0x16. Please try to fix it. But seriously – you are referring to the 64-bit version of Windows 7, while this table is only specific to the X86 platform. I guess I should have noted it in the post, apologies for the confusion. Thanks for the information. Are you going to add the 64-bit versions of the operating systems too? 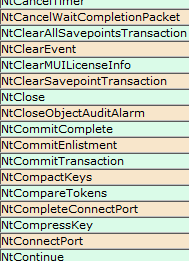 This is already a great table but without 64-bit sys calls the table is kind of useless due to incompleteness. Thanks again for updating and hosting this j00ru! I’m looking forward to the future updates! Thank you very much. I have one little question. Is “Windows 2008 Server” the R2 edition (6.1) or the old one (6.0)? @Plum: Currently, it’s the 6.0 version. U have not provided the arguments of the system calls And data type details of the arguments. I need them seriously. I know, u know that very well, can u send the arguments details of system call. I am creating a portable system call interface for all popular OS. By the way really really thank u for the information…. And what about Windows 10? Just install OllyDbg and get the syscall numbers from ntdll.